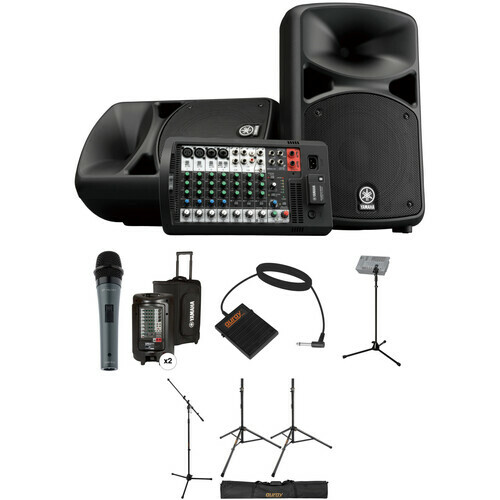 This B&H Kit includes the Yamaha STAGEPAS 600BT Portable PA System with a handheld dynamic microphone, a mixer stand, a mic stand, two speaker stands, a sustain pedal, a rolling soft case for the PA system, and a carry bag for the stands. With a built-in Bluetooth receiver, 680W of output power through two 2-way speakers (one for the main mix and one for a floor monitor), a detachable 10-channel mixer with a feedback suppressor and built-in reverb, and all the accessories necessary for easy setup and transport, the kit is ideal for musicians, DJs, and presenters at a variety of live events. The STAGEPAS 600BT Portable PA System with Bluetooth from Yamaha is an all-in-one lightweight PA that is compact enough to carry by hand. It features 680W of output power, a detachable 10-channel mixer, and is flexible enough to be used in a range of environments and applications. The STAGEPAS PA is equipped with a Bluetooth input for wireless audio streaming from smartphones or tablets. Other features include: SPX digital reverb, 1-knob master EQ, and a feedback suppressor to avoid the uncomfortable feedback that plagues so many sound reinforcement novices and professionals. Add more bottom end to your system by connecting a powered subwoofer (sold separately). Finally, delivering 680W of power respectively, the STAGEPAS system offers a major boost in performance, allowing you to meet the demands of a wider range of situations. The HDM-16-S Handheld Dynamic Performance Microphone from Polsen is a reliable and rugged handheld microphone with an integrated on/off switch. The supercardioid polar pattern and frequency response is optimized for the human voice and can be used for live stage, vocal presentation, and studio applications. The microphone's polar pattern is designed to eliminate off-axis sound. Additionally, an on/off switch lets you quickly silence the mic when necessary. Built with rugged construction, the Polsen HDM-16-S will withstand the rigors of transport and live performances. A 16.4' XLR cable, carry pouch, and a mic clip are also included. The HDM-16-S microphone is optimized for live vocal performances. It has a wide frequency response with impressive sensitivity, which makes this microphone capable of capturing singers and presenters with clarity and accuracy. The dynamic supercardioid microphone capsule minimizes background noise, making the HDM-16-S ideal for vocals or speech, whether onstage or in the studio. Don't let your audience hear what you don't want them to hear. The on/off switch is a convenient feature that lets you quickly mute the microphone between songs or during a pause in your presentation. Take your microphone anywhere. The heavy-duty metal construction will withstand the rigors of transport and onstage use. With the included 16-foot XLR cable, you can plug into any mixing board, sound system, or amplifier with an XLR input jack. Store, transport and protect your STAGEPAS 600i Portable PA System or two MSR100 Powered Speakers from dirt, dust and bumps with the Soft Rolling Case from Yamaha. Constructed from strong and durable nylon, this case features a zipper closure, and an exterior pocket for accessories. A top handle complemented with a retractable trolley handle and two wheels on the bottom are useful for rolling the case over flat ground or hauling into a vehicle. Feet opposite the bottom wheels enable the case to stand upright. Note: Two Soft Rolling Carry Cases are required for transporting the STAGEPAS 600i Portable PA System. The FP-S1L from Auray is a compact, switch-type universal sustain pedal built with high-quality metal construction. It features switchable polarity, making it compatible with most electronic keyboards that have a 1/4" foot-switch input jack. It is equipped with a non-slip rubber pad on the bottom to keep it in place and it features a 72" cable for comfortable positioning. The Yamaha M770 Mixer Stand with adapter is designed to attach MG102C, MG82CX, STAGEPAS 400i, and STAGEPAS 600i Mixers. The Auray MS-5230T Tripod Microphone Stand with Telescoping Boom features durable, steel construction. The telescoping boom arm is adjustable from 19.3 to 33.9" in length, allowing you to angle and extend the mic placement however you need it. An ergonomic twist-action clutch helps adjust the height of the stand, while the reinforced tripod base and non-slip feet keep it firmly and sturdily in place. The Auray MS-5230T mic stand collapses for easy transport. The SS-4320 Lightweight Aluminum Speaker Stand from Auray is built to be lightweight, yet stable and durable; a single stand is capable of supporting speakers weighing up to 100 pounds. It features a telescoping center column with five height adjustments ranging from 47 to 78". It also features collapsible legs for portability, as well as non-slip feet for traction on surfaces such as dance floors and stages. Box Dimensions (LxWxH) 30.0 x 24.8 x 16.5"
Box Dimensions (LxWxH) 8.7 x 4.9 x 2.7"
Box Dimensions (LxWxH) 24.8 x 16.8 x 6.5"
Box Dimensions (LxWxH) 6.3 x 4.6 x 1.7"
Box Dimensions (LxWxH) 37.5 x 3.3 x 3.25"
Box Dimensions (LxWxH) 33.5 x 4.0 x 4.0"
Box Dimensions (LxWxH) 42.0 x 5.3 x 5.0"
Does this come with a cable for the mic?